Oh Cin, liquid bandage, I didn't have any of that, but now I do (liquid skin). I also have anti-radiation tabs K103 and klarity kraton (herb). For allergy relief, I have generic Zyrtec, generic Claritin and Benadryl. Yeah, I really need to get those pet meds, just in case. I have some, but need more. I have many of those so called pet supplies for my tropical fish. So I looked at their expiration dates, some are a year or so past date, but should be good for a few more years, according to what I've read. Now, I started to think of when the last time I was on a antibiotic and it was back in July 2006 when I had my reconstructive knee surgery. My wife was on them two years ago for a UTI. Again I'd rather be safe then sorry. 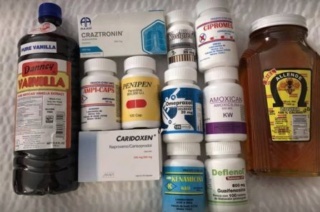 While I plan on adding more to my stock over time so there are a mix of newer and older meds, research shows most drugs are safe way past the printed expiration date. Of course that doesn’t apply to liquid medications so gel caps and pure liquids need to be rotated out. Solid pills not so much. Then again in good times, better safe than sorry so I try to stick with in date stuff, but in an event you use what you have access to. Rick1 my fish are starting to look kinda puny. Where would you recommend ordering some meds for them ? The US Navy did a study of some sort on meds, you can find it online, I believe. Apparently, if kept in a cool, dry place, some meds still have their full effectiveness up to 20 years past the expiration date. Dave58 wrote: Rick1 my fish are starting to look kinda puny. Where would you recommend ordering some meds for them ? Occasionally they’ll sell short dated meds at deep discounts. Good deal for those of us who know the truth about expiration dates. Dave, I only buy Thomas Labs brand, either from them directly or off of Ebay, you may pay a little more for that brand but other companies maybe/are from foreign countries. With that being said, if the antibiotic is made in Canada, I will consider buying from them. I know if kept properly that the antibiotics will keep a long time but I will order new ones and still keep the old ones as a backup. I don't buy any liquid or gel antibiotics, just capsails or solid pill form. I got a LOT of my updated meds in Mexico!! When our son was playing soccer with the pro team, down near Brownsville TX, last year, we went across the border a few times to shop. (He was only about 20+ min from the border. My husbands brother & his wife also live in that area. She buys a lot of meds across the border. She's a school nurse, so she knows what she's doing with her purchases, so she was helpful with my shopping. The prices are SO LOW! My last two trips I got 7 antibiotics, 2 'z-packs', 1 anti-inflammatory,2 huge jars of honey (unlimited shelf life) & 2 big bottles of pure vanilla (unlimited shelf life) each trip!